Small-diameter helical piles have been increasingly used in Western Canada, but there is a lack of research. The present research investigates the axial behavior of three types of small-diameter single-helix piles. Twenty-six helical piles were installed and loaded axially in a cohesive and a cohesionless soil sites. The limit state capacities are attained or extrapolated from the load versus displacement curves following Chin’s hyperbolic assumption. It is found that the hyperbolic assumption can closely predict the load versus displacement curves of the helical piles. The torque factor Kt was smaller for the larger pile shaft diameter in the homogeneous site, whereas in the heterogeneous site Kt is substantially affected by soil heterogeneity around the helix. To further understand the axial behavior of the tested piles, a beam-on-nonlinear-Winkler-foundation model is developed on the platform of the Open System for Earthquake Engineering Simulation, which is a finite element software framework for the computation of soil and structural systems. A parametric analysis is carried out to determine the best estimate of ineffective length, the equivalent shaft length where the shaft resistance is zero. It is shown that the numerical model with ineffective length of four helix diameters can properly simulate the axial load versus displacement behavior. 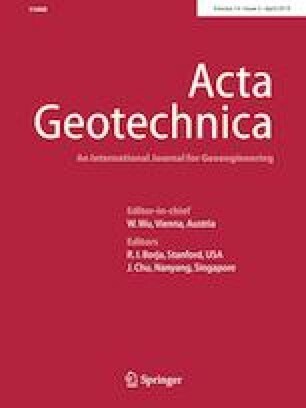 The first author appreciates the financial support of Natural Sciences and Engineering Research Council of Canada–Industrial Postgraduate Scholarship with the contribution of Almita Piling Inc. The authors are thankful to Almita for the permission of publishing the field test results.